YIKES! I hope he responds to the meds quickly. So scary…and weird. Aww, poor baby. Jingles for a quick recovery! Oh man!!!! Poor Jack!!! 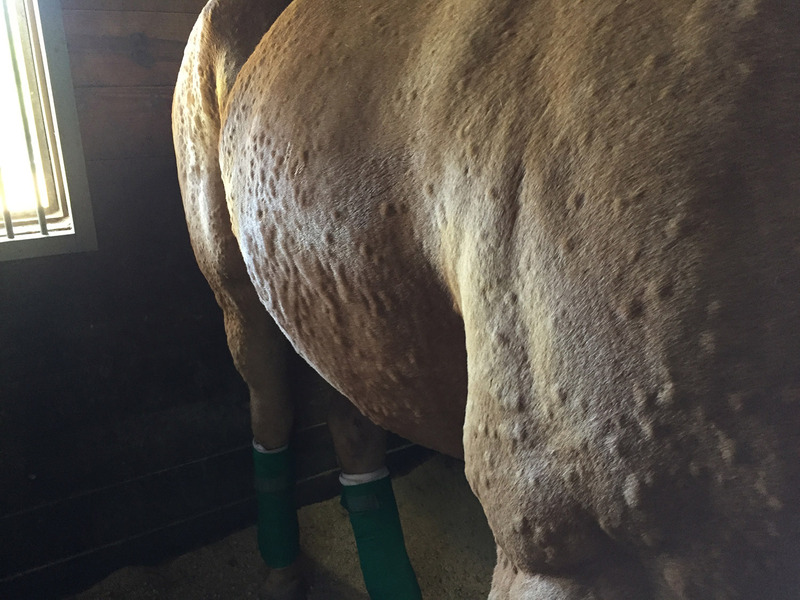 I’ve never seen a horse that blown up with hives so not much help here but it sounds like you’ve got it under control? Hope he feels better soon and the swelling goes down!!!! that is very scary….i had a horse that hived on grass (reaction to some weird grass in field) but it resolved itself pretty fast (That was all we could figure out it was he was rolling in pasture and got up and viola). 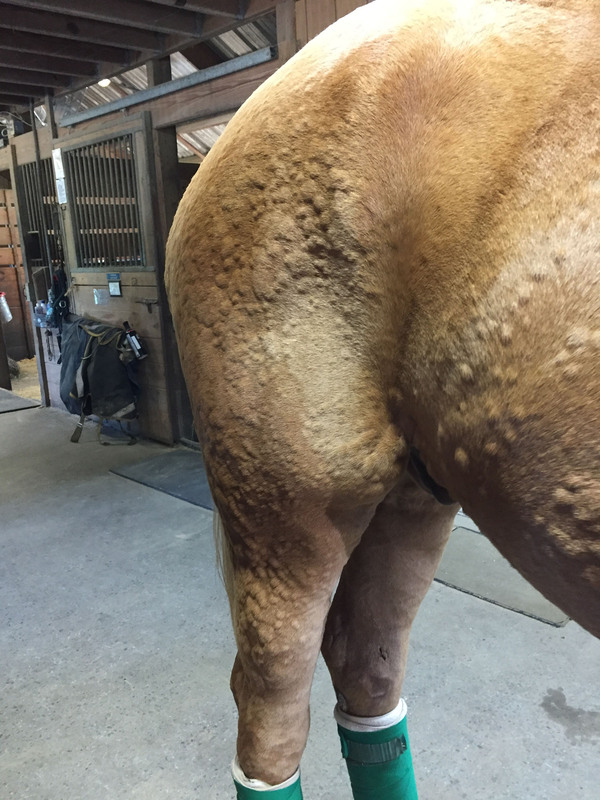 My horse goes through phases of being covered in hives, just like this, for years. Unfortunately we have never really gotten to the bottom of them as it’s nearly impossible. Hers are definitely seasonal, popping up in spring and summer only. We have never been able to figure out if it was changes in hay/grass or related to bug bites as they were all nearly impossible to “eliminate”. Best we could do was cover her head to toe in fly gear, keep her hay as consistent as possible, and keep a bottle of dex on hand for flare ups! Good luck. 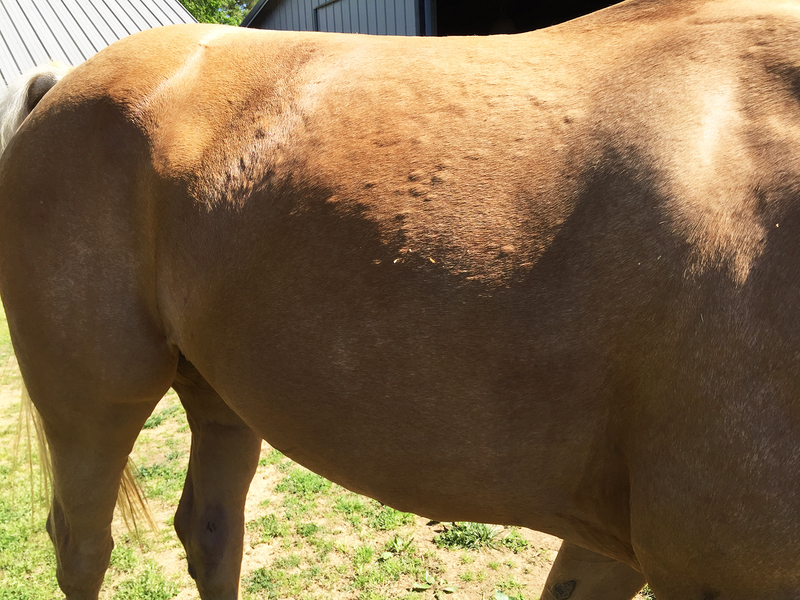 Oh yes, I have a mare who loves to break out in hives like this. It scares me half to death but dex and banamine always seem to help. I actually keep dex on hand because she is so prone to this, so I can dose her even before I call the vet. 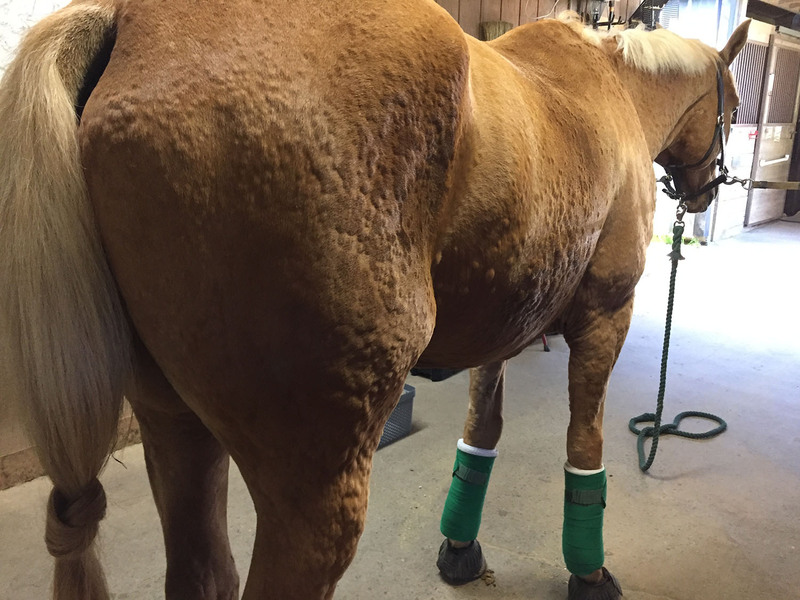 She’s done it for no obvious reason, once she did it after spring shots, and one time she had it in conjunction with a COPD/RAO episode (think asthma attack in a horse who is panting – not fun!). I hope Jack bounces back to his old self soon! Hang in there! I have 2 who break out in hives. I’ve gotten Subi’s under control as they’re from gnats, but we haven’t figured out the cause of Batt’s hives. 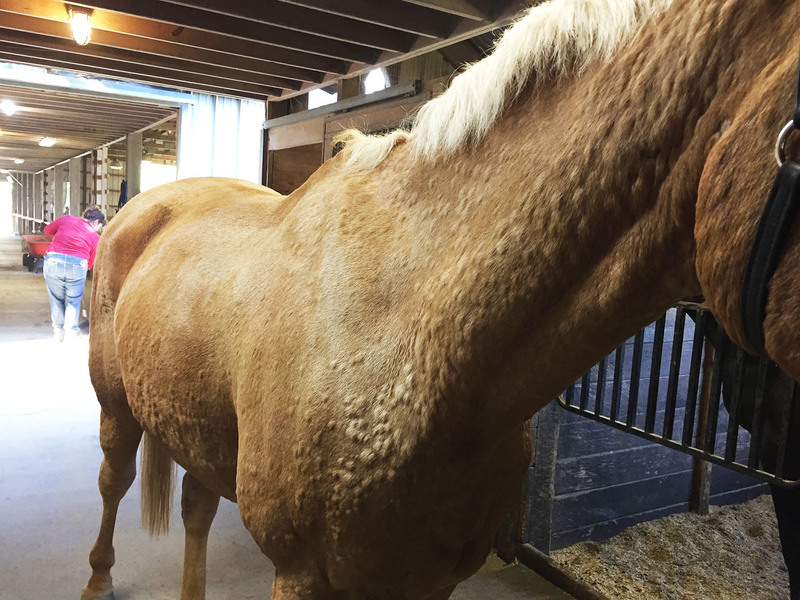 He even broke out when he was at New Bolton recovering from a severe colic… I always try and keep dex on hand for the hives. I’m out so I should probably pick some up from the vet. Kat’s (Calipony.blogspot.com) mare Holly got Hives every year, seasonal allergy for that mare – not sure if we ever got down to the bottom of it. Poor boy. That’s a lot of hives. I had a camp horse do that one year, but we didn’t know what caused it and he was fine a few days later. Yes. Tristan looks an awful lot like that when he really breaks out. I did what you did here the first few times – baths, ice, dex. Last summer, we put him on oral antihistamines for the whole summer and he never had an incident. We never figured out what caused it. Our best guess was that he was rolling in or eating something in his field. He now gets a full fly sheet + fly mask as soon as it starts to get green, regular baths, and the drugs. I have high hopes that it will work again this summer. Yep, Pig has done this once. We had an incredibly wet early summer (rain every day for over 2 months! ), and he just puffed up. Dex did the trick, but we had to keep him on zyrtec until it dried out. Apparently there’s some kind of fungus in the ground here only activated by intense, long-lasting rain. Note! Antihistamines are illegal to show on with USEF! Make sure you withdraw them correctly in case of drug testing!